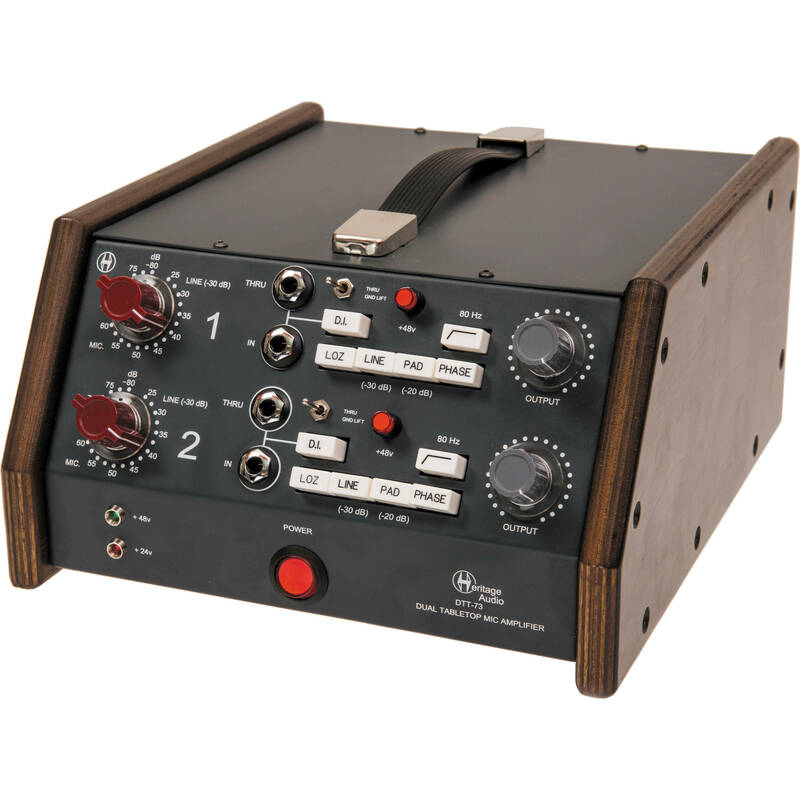 The Heritage Audio DTT-73 Dual Tabletop Microphone Preamplifier is a wood and steel chassis dual 80 dB microphone and 10 dB line recording preamplifier module based on the vintage 1073 module designed by Rupert Neve. The remake is intended for recording engineers who want the classic Neve sound in a portable tabletop footprint, but do not need the equalizer functionality of the original 1073. The unit includes a handle for carrying and has the versatility to be used on stage, on the road, in hotel rooms, and other applications outside of a traditional studio. The preamplifier supports selectable HI-LO minimum balanced and floating input impedances that accommodate a range of microphone types including vintage ribbons. A +24/48V phantom power button with separate phantom voltage indicator lights is included on both channels, as well as an input level knob for adjusting to your source. You can also switch the module into line mode to re-amplify pre-recorded tracks and add color to a mix. Plugging in a mono 1/4" input into the DI port on the front of the unit automatically switches the module from MIC to DI mode. On each channel, the unit also includes a 1/4" DI thru jack for connecting to an instrument amplifier when using the unit live on stage. A selectable discrete component Class A 3rd-order 80 Hz high-pass filter with an 18 dB per octave slope has been added for recording sources without the effects of low-frequency coloration. An output control knob is included to prevent overloading the preamplifier. The unit is powered by an internal noiseless worldwide power supply designed to reduce the effects of electromagnetic interference on the audio transformers. A ground lift switch is included to remove ground loops. The preamp features gold-plated Neutrik XLR input and output connectors. To achieve the classic feel of the original 1073, the unit is constructed with Marconi-style knobs and vintage engraved pushbuttons for the DI, low impedance, line, pad, phase, and high-pass functions. Box Dimensions (LxWxH) 13.7 x 12.6 x 6.1"